Lion is the 3rd plan in our “Big Cat” series of tactical Fire/Rescue Training Plans. Lion is a 4 day/week, 6-Week cycle, for 24x Sessions Total. 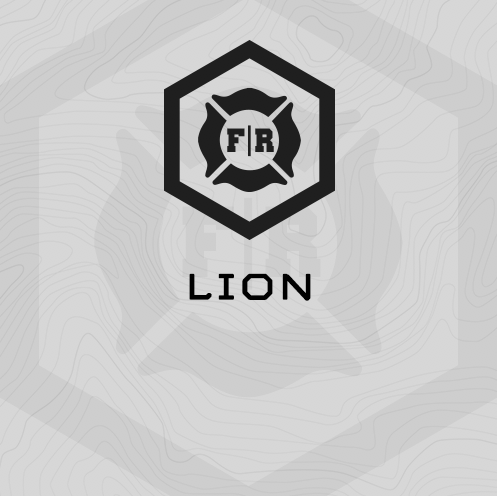 Lion deploys our most recent iteration of Fluid Periodization, and is a “balanced” cycle – training Strength, Work Capacity, TAC SEPA and Chassis Integrity in equal proportions across the cycle. With Lion we deploy our “357 Strength” programming methodology for strength work. Two days/week, you’ll complete heavy Total Body/Lower Body, Total Body/Upper Body, or Lower Body/Upper Body exercises followed by a short, intense 2-4 minute bodyweight work capacity effort designed to complement the heavy strength exercise in the session. Lion’s work capacity efforts alternate between 20-minute AMRAP efforts build around step ups, and short, 2-minute intervals completing 40-foot shuttles. Focus this cycle is agility drills with level changes – unloaded, then loaded. Two times/week, with the first circuit of a total, anti rotation and rotation exercises, and the second circuit combining 3 low back exercises.